Looks are subjective. The “carbon” Scout looks evil and will scare small chilldren and horses. The slightly smaller Phantom is more aeronautical, some would say toy like, but these quads are definately no toys! The Scout is NOT made of Carbon or Carbon Fibre but a plastic shell with a carbon fiber look sticker on it which started peeling off at the front. The size difference its negligible – wingspan (prop-span) when we have sat them next to each other is virtually the same, and of note the DJI Phantom 2 Vision Plus has larger props than the Scout. It all starts with the unboxing. Because the Phantom has been out for some time, it’s immediately obvious DJI have spent some time refining their product and packaging. Many instructions and warnings are included wrapped around various parts making it much easier for the novice end user. The Scout is packaged well, the version I got was protected in a molded plastic tray and looks immediately impressive, you can also order a version packaged in an aluminum carry case, though from my understanding you need to remove the legs, gimbal and props making it not very functional for regular use, but good for storage and traveling. Documentation is easy to follow for the Scout, but lacks much detail and has now been found to be incorrect or insufficient in places. For example, the PC software “Mission Planner” doesn’t even get a mention, yet this is required to adjust many of the firmware settings on the Scout. There is no manual or instructions at all for the Bluetooth-2.4g ground-station, it’s only mentioned briefly in the GSC startup guide, so before you even use them the Phantom gets points for being more user friendly. Check out the ever expanding SCOUT X4 GETTING STARTED GUIDE for more details. 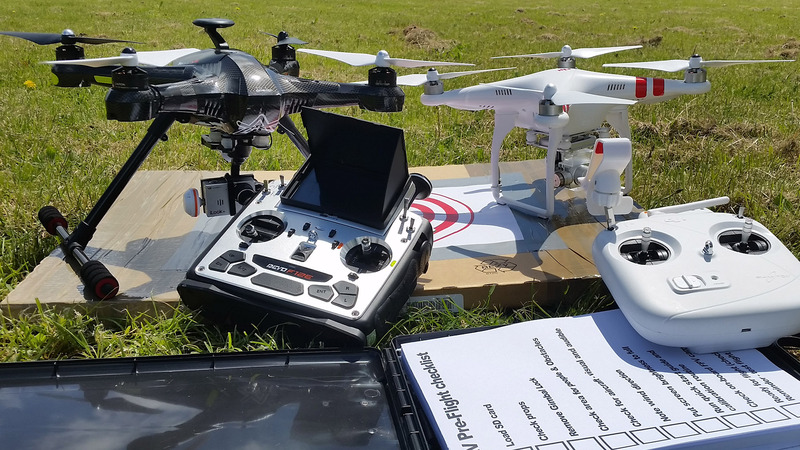 The Phantom flew pretty well in GPS mode straight out of the box, however the Scout required flying in the more challenging full manual mode for the first 10 minutes according to the beta testers – adding more of a challenge first up for beginners. It does fly well in this mode but it demands constant attention as it’s entirely up to user input to keep control. The Phantom and Naza flight systems should be calibrated before every single flight, where as the APM controller on the Scout should only be calibrated once (unless your moving over 200km away or alter hardware/software) and “learns” as it flies and slowly improves. Once GPS is locked and has settled on the Scout loiter mode is much the same as the Phantom having flown them next to each other however the Scout runs on for about 10m before settling when you let go of the sticks, whereas the Phantom stops almost instantly. It has since come to light that MANY modifications and software changes should be done to make your Scout safer and more reliable BEFORE flying, it is NOT “ready to fly” making it difficult to recommend the Scout to anyone – especially beginners as there is a massive learning curve which requires some technical knowledge, skill and plenty of time and patience. The Scout seems faster and more powerful than the Phantom with the (possible) ability to upgrade to 8x motors to carry a larger payload at the expense of flight time and is certainly fun to fly but that’s in part due to how the software is set up differently from the factory on each craft which can me modified to suit. Unfortunately for me, I can testify that despite taking some big hits due to software and hardware malfunctions and admittedly the odd pilot error, the Scout is pretty tough. I’ve heard complaints by others that the legs are weak, but I’d rather replace a $6 leg pipe than have it spear through the body and wreck expensive electronics! The common replacement parts like props and legs, are pretty cheap and even a body shell or a motor can be had for under $40. The most vulnerable and expensive part is the gimbal, the Scout’s G-3D is half the cost of the Phantom’s. Repairs on repairs! After this crash it’s time for a body transplant. Luckily no damage to any electronics. The Phantom Vision+ is equipped with a much better standard camera. The Scout’s iLook has a blue hue, low on red and higher contrast. When 1/4 of frame is sky the ground often becomes very dark and hard to see so you need to point the camera downward for best results. You can only take either 12MP stills OR video and have to land to change modes while the Phantom lets you do both and offers RAW format for better post processing as well as software access to settings like ISO, white balance etc. providing much better results. Both craft do a good job with image stabilization, but the Phantom does a better job out of the box. We’ve yet to test what kind of load they can carry, I’m considering a Sony RX100 and updated gimbal or a GoPro4 as possible future options for the Scout but would expect flight times to take a hit. I safely get 17-18 minute flights on the Scout, the Phantom will happily fly for around 25 minutes, both with camera and active flying. The two craft have the radio frequencies set up differently. The Phantom uses 5.8g for control and 2.4g for video while the Scout uses 2.4g for control and 5.8 for video, meaning most camera upgrades for the Scout will also require the additional purchase of a 5.8g VTX. The Scout has retractable legs, though the servos are a poor design and need to be modified to avoid breaking and potentially shorting out your main board in flight!! – there’s an upgrade kit for the Phantom. The Scout’s controller is all nicely integrated but the built in screen isn’t brilliant in bright light. The Scout is brand new and unproven and offers much potential, but so far too many problems are surfacing, there are unresolved issues and there has been a complete lack of support directly from Walkera. Hopefully Walkera will support it and their customers – like DJI have with the Phantom, which has been refined and improved greatly upon since it’s initial launch. The Scout looks awesome, offers so much promise but actually delivers very little and is not for beginners. It flies well when it does and is slightly bigger and more powerful so should lift a bit more. Now, I don’t mind researching, rolling up my sleeves and tinkering with the Scout. It’s often been quite frustrating, at times heartbreaking yet an interesting learning experience, but to be honest – I would rather be out flying and taking photos. After over 60 flights I still can’t trust the Scout so it doesn’t suit it’s intended purpose. I’m now more nervous when I fly it wondering if something else will go wrong and I’m very relieved when it lands. My mate has had NO problems with his Phantom and is full of confidence in his craft. If I were to choose again with hindsight, I would go the Phantom – or start looking at other options – at least until Walkera lift their game. I have now abandoned my Scout X4 and built myself a DJI Flame Wheel F550 ARF Hexacopter kit. 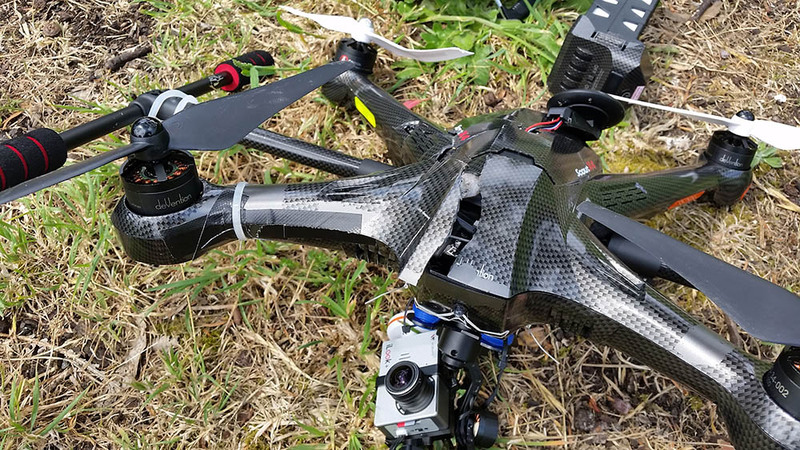 After 60 flights with this new UAV I have not had a single issue and have full confidence in it’s reliability. Based on my personal experience, I would NOT recommend purchasing the Scout, it is simply not RTF or reliable. In summary, don’t buy a Walkera Scout X4, look at other options. Hi guys. Thanks for your thoughts on the Phantom and Scout. A friend and I are looking at exactly this question, in terms of buying some quads. As you say, the Phantom offers a more user-friendly experience straight out of the box. Set against this, the Scout seems to have some functional benefits such as included FPV display, on-controller gimbal levers etc, and possibly better value overall for some applications. We are planning to use GoPro cameras, and would very much appreciate your posting any further tests you carry out. We’ve just started really, I haven’t mentioned the benefit of the Devo F12E transmitter compared to the Phantoms. It’s a good quality all in one controller. The screen can be difficult to see on bright days but as you say, there is an output for goggles or another screen. Accessing telemetry requires a dive through the menu though which is a bit clumsy. The Phantom has better default telemetry, the Scout can be upgraded with minimosd telemetry – I have to research this more. Hi Dale, I generally get very little video interference until the Scout is about 200m away – it seems to have a maximun range with supplied antenna’s of around 300m. I’ve just added an Antenna section towards the bottom of the mods page – still researching antennas but I’ve put some links up on what I’ve found so-far. Hope it helps.